When you set up the shape of your Elliptic Zone of Influence you should be as accurate as possible and make sure that only the element that you want to follow the deformation is included inside the zone. 3. In the Network view, select the deformer’s module to which you want to customize the Elliptic Zone of Influence. 4. Click on the deformer module’s square yellow button to open the Layer Properties dialog box. ‣ Symmetric Ellipse Influence: This option is enabled by default. When enabled, the shape of the ellipse will be symmetrical on both the transversal and longitudinal radii. In this case, use the Transversal Influence Radius Left field to set the transversal radius value and use the Longitudinal Influence Radius End field to set up the longitudinal radius value. The two other fields will remain unused, unless you disable the Symmetric Ellipse Influence option. In that case, you can set up different radii sizes for the four radii directions. ‣ Transversal Influence Radius Left: When the Symmetric Ellipse of Influence option is enabled, this field controls both Left and Right transversal radius values. When the option is disabled, it controls the size of the left transversal radius. By default this value is set to 2, use the up and down arrow to select a value or type the desired one directly in the field. 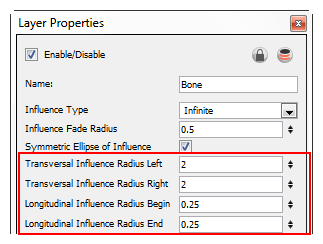 ‣ Transversal Influence Radius Right: When the Symmetric Ellipse of Influence option is enabled this field loses its influence and the Left Transversal radius value is automatically applied to the Right Transversal. When the option is disabled, it controls the size of the Right Transversal radius. By default this value is set at 2. Use the up and down arrows to select a value or type the desired one directly in the field. ‣ Longitudinal Influence Radius Begin: When the Symmetric Ellipse of Influence option is enabled, this field loses its influence, the End Longitudinal value is automatically applied to the Begin Longitudinal. When the option is disabled, it controls the size of the Begin Longitudinal radius. By default this value is set to 0.25, use the up and down arrows to select a value or type the desired one directly in the field. ‣ Longitudinal Influence Radius End: When the Symmetric Ellipse of Influence option is enabled, this field controls both Begin and End Longitudinal radius values. When the option is disabled it controls the size of the End Longitudinal radius. By default this value is set to 0.25, use the up and down arrows to select a value or type the desired one directly in the field. 6. You can also modify the elliptic shape in the Camera view, using the Transform tool. ‣ If the Symmetric Ellipse of Influence option is enabled, one control point will be available in the Camera view. Drag this point in any direction to increase or decrease the size of the Zone. Dragging it left/right will modify both longitudinal radius sizes. Dragging it up/down will modify both transversal radius sizes. ‣ If the Symmetric Ellipse of Influence is disabled, two control points will be available in the Camera view. Drag the top corner point left/right to modify the end longitudinal radius size and up/down to modify the left transversal radius size. Drag the bottom corner control point left/right to modify the beginning longitudinal radius size and up/down to modify the right transversal radius size. You can also select the Zone of Influence type in the Rigging Tool Properties to change the default setting before creating a deformation chain. Refer to Rigging Tool Properties on page 1.